Gov. Jan Brewer of Arizona easily won her party's gubernatorial nomination Tuesday night. (CNN) - Republican Gov. 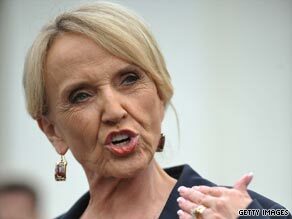 Jan Brewer of Arizona easily won her party's gubernatorial nomination Tuesday night, according to a CNN projection. Brewer captured 87 percent of the vote in the GOP primary election, according to early unofficial vote returns from the Associated Press. At the time that she signed into law her state's controversial immigration measure, Brewer was involved in a competitive primary battle. But Brewer's political stock within Republican circles soared in the months after she put her signature to the bill, and two of her primary challengers dropped out of the contest. (CNN) – Sen. John McCain has won the Arizona GOP Senate nomination over challenger J.D. Hayworth, CNN projects. (CNN) - The Republican Governors Association reacted Tuesday night to Rick Scott's victory. Read the full statement from RGA spokesman Tim Murtaugh after the jump. (CNN) - Rick Scott is the winner of the GOP nomination for Governor in Florida, CNN projects. 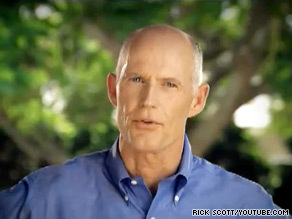 Rick Scott is locked in a primary battle with Florida Attorney General Bill McCollum. (CNN) - A millionaire political newcomer held a slim lead late Tuesday against Florida's attorney general in the Republican primary for Florida governor, according to The Associated Press. Former health care executive Rick Scott was ahead of Florida Attorney General Bill McCollum, 46.5 percent to 43.2 percent, with 75 percent of precincts reporting, according to the AP. The winner will face a November general election against Alex Sink, Florida's chief financial officer, whom CNN projected will win Florida's Democratic primary for governor. In Florida's Democratic primary for U.S. Senate, Rep. Kendrick Meek has defeated billionaire Jeff Greene, CNN has projected. Hollywood, Florida (CNN) - Rep. Kendrick Meek, giving his victory speech after winning Florida's Democratic Senate nomination, thanked President Barack Obama and former President Bill Clinton. After numerous stories that Obama wasn't doing enough to help Meek's bid for his party's nomination, White House officials recently stressed that the president was firmly supportive of Meek. Obama appeared with the candidate last week, giving Meek a hug upon arriving in Florida for a Democratic party fundraiser. Meek also spoke at the fundraiser. And Clinton headlined three Meek rallies last week. The former president had already served as the main attraction at several fundraising events for Meek and penned fundraising e-mails for the candidate. Hollywood, Florida (CNN) - Kendrick Meek used his victory speech Tuesday to try and establish himself as the candidate for Democratic voters in November. He noted that he is "running against two conservative candidates" - a clear swipe at Charlie Crist, the Republican turned independent who could siphon votes away from Meek in November. 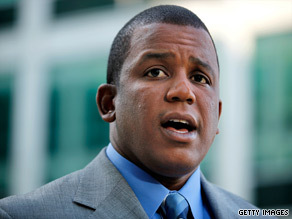 "I made the case and I am the real Democrat in this race," Meek said. Florida Rep. Kendrick Meek thanked his supporters in an e-mail Tuesday after securing the Democratic nomination for Senate. Hollywood, Florida (CNN) - Rep. Kendrick Meek hasn't even given his victory speech yet, but he's already reaching out to supporters. "We did it! I am about to step on the stage at our rally here in Miami, but I wanted to send you a quick note of thanks before I do. All of our hard work paid off – I am officially the Democratic nominee for the U.S. Senate. I am 100 percent certain that we couldn't have gotten here without your dedication and support. The pundits thought this seat could be bought. Our critics wrote us off. But, together, you and I proved them wrong. We defied the odds.